Looking for a mural for your salon? Interested in turning your spa into an oasis of peaceful relaxation? Then Magic Murals has exactly what you need! If you've been looking for a wall mural that will give your place of business a whole new aura, then look no further. Magic Murals has the wallpaper murals that can set the mood. Maybe you feel that your spa needs a new look. 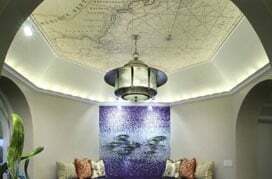 Magic Murals has plenty of images that can turn your spa in a haven of tranquility. Transform your walls into a seaside paradise, teeming with palm trees, serene waves, and beautiful sunsets. Help your clients relax with a room full of beautiful flowers, leaves with gentle water droplets, crystal-clear lakes reflecting the mountains and blue sky above. If you can imagine it, Magic Murals can make it happen! What kind of look do you want? Possibly a beautiful artistic pattern, to give your rooms a feel of texture? 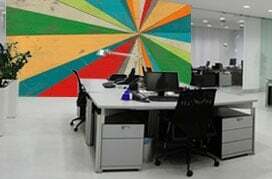 Or would you like your office to be framed by a flowing waterfall, green with summer and gardens of blooming flowers? Find the image that will serve as a wall mural for your home or office. You can even upload your own! Magic Murals has the images for any mood. There are pictures of peaceful scenes, quiet places, perfect for a meditation. Your setting could be a wall mural with world landscapes, tropical paradises, historic landmarks, Italian gardens, or simply fields of green. If your salon needs to create a brighter mood, Magic Murals can help! Scenery from the mountains to the beach, a landscape with a flowing stream, blooming flowers, or even fish, trees, or rivers – any of these would look great in a wall mural in your home or business. Magic Murals provides the highest quality professional images, and at prices that are very low. Select an image that would be perfect for your spa or salon – beautiful flowers, reflections of a blue sky, a relaxing sunset on the beach, regal gardens, or simply quiet places that would transform a room into an environment perfect for tranquil meditation. Upload your own image, and talk to our professional staff. Installation is very simple. Ready yet? Got a look you love for your home or business? Give Magic Murals a call today!